The word bisque is derived from porcelain being left in the “biscuit” stage of manufacture. It is unglazed, so it has a matte finish rather than a shiny surface. Bisque pieces are somewhat porous, so it shouldn’t be submerged in water for cleaning. 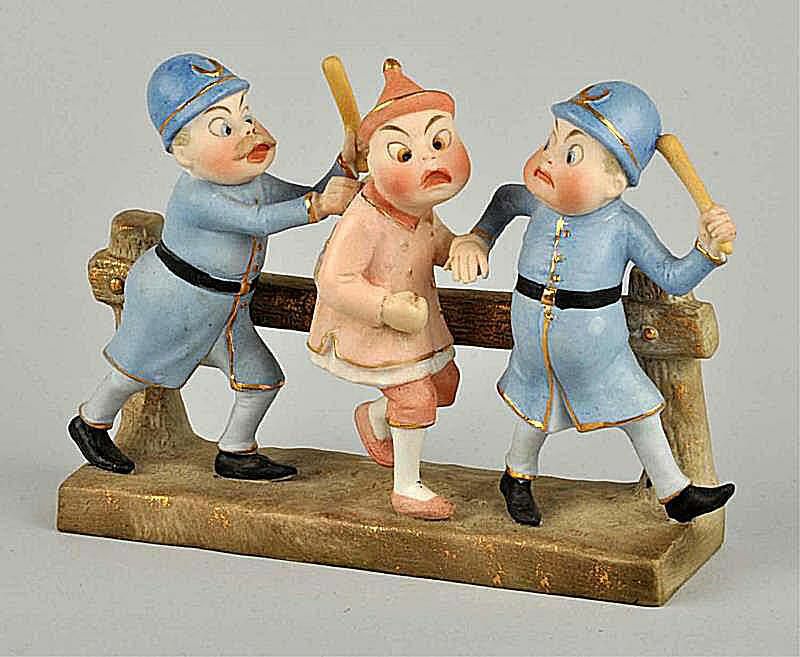 Many figurines were made of bisque porcelain, and it was also a common material for use in manufacturing both German and French dolls in the late 1800s and early 1900s. According to Caring for Your Collectibles by Ken Arnold for Krause Publications, soft-paste porcelain is “made from fine clay combined with a variety of different materials” and fired at lower temperatures than hard-paste porcelain. Thusly, the materials to not fuse together, or vitrify, like hard-paste examples. It is softer, as the name implies, and can be cut with a file. Because it is soft, it also scratches and chips more easily. Sometimes it is referenced as “artificial” porcelain because of these differences. Glaze on soft-paste pieces “sits on the surface,” according to Arnold, and it tends to accumulate in small crevices. The surface also appears grainier when compared to hard-paste pieces, but there are many valuable items made of soft-paste porcelain so each object must be examined for merit before assigning a value. Hard-paste porcelain is “made from kaolin, quartz, and feldspar, which is also called petuntse or china stone” and it is fired at high temperatures, according to Caring for Your Collectibles by Ken Arnold for Krause Publications. The high temps cause these pieces to become vitrified, meaning that the various elements are fused together making them harder and more durable when compared to soft-paste porcelain. This is sometimes referenced as “true” porcelain. Meissen and Sevres are two names associated with early hard-paste porcelain. The glaze on hard-paste porcelain also fuses with the body of the piece when it is fired. The finish is more glass-like and smooth on these objects, and they often have a translucent appearance.